Five Weapons seems like it might just be another anime-inspired comic, and to be fair it kind of is, but it's not bad. 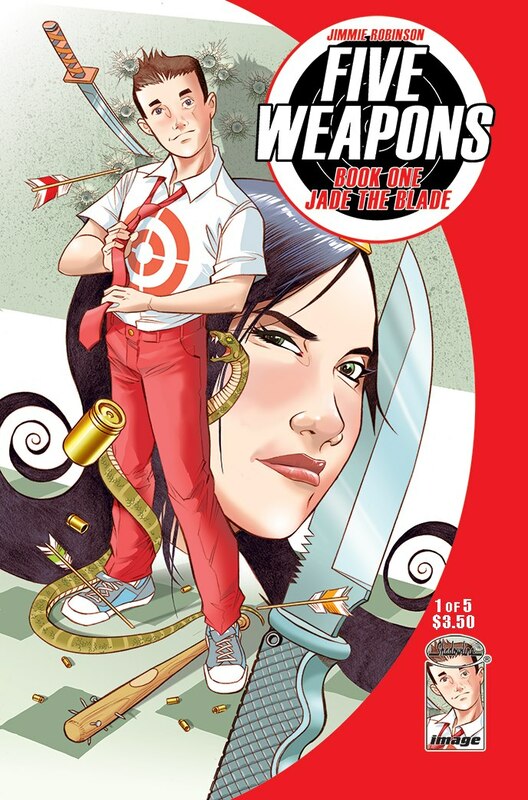 Jimmie Robinson's Five Weapons is set in a world where assassins are apparently a family business and the kids take over once you retire from taking contracts. I know if I was a heartless killer, I'd be very concerned that my kid wouldn't get the right education on how to properly kill someone. The plot is a little trite. The son of a famous assassin goes to his first day of school at a somewhat prestigious academy for assassins. At this school you are forced to join a club that focuses on one of five groups of weapons: blades, staves, bows, exotic weapons and guns. There is too much mystery surrounding characters, in a way that makes it seem really forced, and then there is the usual love/hate relationship between the lead and a female character. It's the standard cliché, but it isn't done poorly, which is a good way to describe this book. Sure, the book has it's clichés, but it does them well. It knows what it is, and it rocks it. However, the art is mediocre. Robinson made some interesting character designs for the staff of the school and some of the club leaders, but they seem a bit too quirky. They don't quite belong in the somewhat normal looking world. I think it was supposed to cement the fact that there is something off about this place, but it just makes the book seem off. Particularly the principal that looks like she's right out of Umbrella Academy. This first issue is a little mediocre, but miniseries are always hard to get a great first issue. The important thing is that there is a good hook. Enough for me to check out the second issue, at least. I hope it focuses on the gun club, with the orthodox Jewish leader. That way I know it'll be better. At least it will be for me.